Our new Wood Bead Curtain "Tao" is really fabulous and the attractive design and rich colors will have you wanting more than one! The dark brown beads mixed with beige beads in an arch-type design creates a spectacular accent piece that will go with any Decor! This well constructed curtain is 69" long and has 27 strands hanging from a woven beaded design with about 1.5" space between the strands. 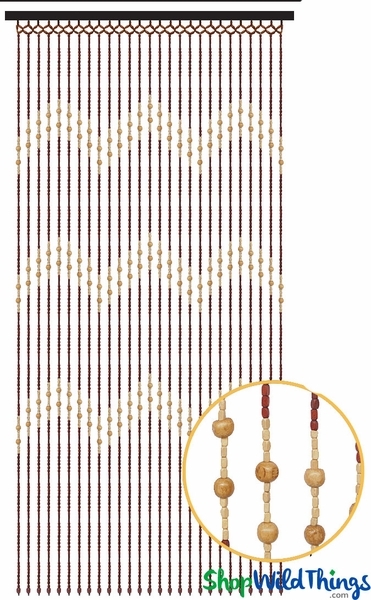 Beaded curtains are a hot item to use as room dividers, wall hangings or to use as backdrops for parties and stages. Their natural colors and the fact that you can hang it straight out of the box make them easy and popular and they look great hanging loose or tied back. The dark brown head rail is 35.5" wide and has 2 eyelets for immediate hanging. Natural materials are not perfectly exact so expect some slight variances in the strand lengths. Two minutes and two nails will do it! Watch our delightful video on this page to learn how easy and fast it is to hang beaded curtains. If you've got questions, consult our expert in-house staff. We've been selling the highest-quality beaded curtains available to movie production companies, theater stage designers, top party planners and individual customers since 1989. Along the way, we have become the world's leading and most trusted online seller of curtains, canopies, chandeliers, backdrops and event lighting. This is an entirely handmade item. There may be slight color and slight length variations from one wooden curtain to another. This item is not made by a machine. People make the beads and then hand-string each bead onto the line. The overall look and pattern of the curtain will be as depicted in the showcased images. Please allow for those variations that are inherent to handmade items. We needed an inexpensive curtain in our shop that would let customers know not to enter our office space, but that could also offer quick, hands-free access when staff needed to carry boxes and other items into the back. Previously we had a raffia type curtain that tangled and often got caught up, but the beads on this curtain slide out of the way nicely and look great. ProsGreat look and practicality at a good price. The bead curtain arrived in time and is beautiful! Exactly what I was looking for. So far so good. No issues. ProsI received what I would have hoped to. ConsI wish hardware to hang the product was included.